It is a widely held belief among organizations that forging long-term relationships with dedicated vendors is crucial for supply chain excellence. Industries like the auto sector have understood this better than others. Most auto OEMs have dedicated vendor setups close to their own setups in the interest of just-in-time supply. Their pricing arrangement is period-based rather than transaction-based for seamless movement of inventory. Many consumer goods and equipment manufacturing companies have adopted similar models, more out of the need to outsource manufacturing content and reduce in house labor than for any other reason. The arrangement appears like a collaborative, interdependent partnership, where each party focuses on its core competency. When overall economic growth is good, and everyone in the chain makes money, the model can appear like an epitome of successful win-win partnerships. However, it is in the recession years, when sales, profits and working capital come under pressure that cracks develop in the relationships. In the last five years, the Indian economy has gone through two slow-down phases – in 2008 and in the last couple of years. Sectors like engineering, auto and consumer goods experienced sales pressure. 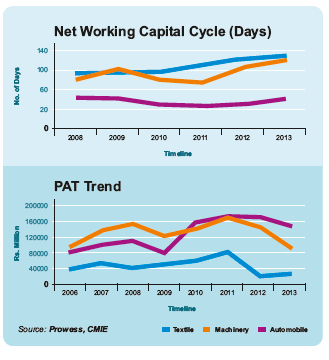 Profits dipped, working capital rose. Resultant impact has been a shift of focus in management from “growth ideas” to “reductionist ideas”. Initiatives for reducing working capital, cutting material costs and fixed costs are dominating boardroom discussions. With a crisis-like situation looming in many companies, these initiatives are under a lot of time pressure to yield results. With pressure comes the need to resort to harsh measures that will give immediate results. These are usually meant for and imposed on the weaker entity in the chain – the “partner” suppliers. When pricing to end customers is under pressure, organizations typically look at vendors to support them in retaining margins. Buyers in the organizations are given aggressive targets; they are directed to re-negotiate pricing terms with the vendors. Large organizations even hire outside expertise to identify, and at times, directly negotiate with vendors using templates of “correct” costing. The overall recessionary mood, with capacities going unutilized, creates an atmosphere of desperation. In these conditions, there is an abundance of new players willing to price products using marginal costing principles to gain entry to established vendor networks. Power relationships are manipulated to force vendors to drop prices. Alternatively, new and cheaper vendors are added to the network to create “competition”. Recessions typically also bring along a liquidity crisis. Receivables not only expand in time but also become difficult to collect. Organizations find themselves under pressure to deploy more capital to manage much lower volume of sales than they did during other times. Many get into the mode of using vendors’ cash to improve their conditions. • Adhoc delays in vendors’ payments. • Formal increase in payable periods. • Delayed off take of material made by vendors, even after, it is made as per confirmed schedules. Both approaches of pushing “capital” and “costs” back to vendors are myopic and have disruptive ramifications for organizations not only in the long term but also in the short term. Short Term Impact: When smaller, dedicated vendors are not paid on time in recession periods, they are pushed into a bigger crisis than the organizations they service. Stuck between the proverbial rock and a hard place, they take desperate actions to protect themselves. Many cut down on raw inventory or prune labor capacity. These indirectly lead to disruptions in supplies. The effects of these measures would be clearly seen if one were to do an analysis of parts availability at the auto OEMs, the entities that are heavily reliant on “partner” vendors. With excess capacity becoming available at the vendors’, one would expect parts supplies to improve. However, at most OEMs, parts availability takes a hit. The everyday search for parts, manic and frequent rescheduling only takes a turn for the worse. The few sales orders that trickle in are cancelled or their fulfillment delayed. OEMs that depend on a large number of vendors to bring in parts for assemblies suffer more when cash flow issues cripple the production of even a handful of vendors. High level of mismatched inventory almost nullifies the gain in payables period derived by delayed payment to vendors. Long Term Impact: When the economy recovers and there is a sudden hunger for extra capacity, vendors try to restore capacities. This capacity enhancement comes with a built in lead-time, resulting in a disruptive supply chain and potential sales loss for the parent organization in the transition period. Many vendors also use the opportunity to price the product higher to account for increased payable period of the organization. When organizations add new vendors to bring about“competition” amongst existing vendors,“partner” vendors, particularly those with large capital investment, are forced to look for new avenues to fill up capacity. Their “dedication” weakens causing day-to-day conflicts in scheduling, which in turn affects deliveries to the main organization when business starts reviving. The experience of downturn also makes vendors wary of adding dedicated capacities for the organization. Thus begins a never-ending search for an “ideal” partner. The “rationalized” vendor base expands. More vendors means more effort for coordination. Eventually, organizations realize the need to consolidate vendor base. Many keep switching between paradigms of more vendors for more competition and consolidated fewer vendors for smooth coordination. The long-term growth story of India is still intact. The periods of economic slowdown will always be short, thanks to the increasing number of prosperous middle class Indians. Hence organizations can create a sustainable supply chain for a long term only if they avoid the disastrous short cuts in the short periods of downturn. Easing the pressure on cash and profits, however, is a genuine challenge. Not many organizations will be able to compromise short-term goals for long-term good. The only way out is to deal with short-term challenges without giving up on long-term goals. This is possible if organizations look at vendor supply chain and their internal operations holistically to release the hidden value both in terms of cash and margins. Companies look at the inventory MIS at the month end, quarter end or year end to conclude about value locked. They shouldn’t. To get the real picture they should be looking at daily inventory. Many discrete manufacturing companies have a skewed inventory profile in raw material, WIP and finished goods. The profile peaks as inventory balloons towards the middle of the month and falls with the flush out at the end of the month. Working capital deployed in the business is determined by the peak rather than the month end numbers reported in the monthly MIS. This way of working creates wide variability in manufacturing lead time, which is also one of the main guzzlers of working capital. This way of working also locks up working capital of partner vendors. To understand the compulsion of increasing payable period of vendor one needs to understand how pressure of working capital builds for organizations. For many equipment manufacturing companies, engaged in assembly and erection at the site, the receivables do not exactly reflect the collectible amount. Parts supply allows companies to book turnover and receivables, but when payment terms are tied to erections and commissioning, the large time gap between supplier payment and actual collections eats up working capital. The gap widens in downturn as companies try to bill out of sequence to make up for sales. The conflict between controlling receivables and pursuing turnover growth at the same time is not only seen in case of custom-made equipment but also in standard products sold through dealer networks. During a downturn, push sales leads to ballooning of inventory and then to cash flow crisis for dealers. In both types of industries, the inability to manage receivables and inflated working capital forces organizations to resort to delayed payments to vendor partners. In supply chains, where inventory flow is skewed, the capacity deployed for managing growth is always to manage the peak, leaving pockets of capacity wasted. This wastage is never revealed in the output figures reported in the monthly MIS. The capacity wastages (hidden) find their way into product pricing of vendors. (The only way to identify this wastage is to check the difference between the touch time of an operation in critical work center and compare it with the total available time for a period). Organizations stand to gain both in the short term and in the long term if they focus on accelerating inventory flow while minimizing the variability of flow in the entire supply chain. The epidemic of month-end, quarter-end and the year end skew in many organizations points not just towards a persistent, unresolved problem of many decades but also to the enormity of the problem in the entire industry. Investment in enterprise IT tools in the last few decades has not changed this reality for many organizations. It is time for a close look at the conceptual framework of existing supply chain practices. The wave of inventory is typically due to concept of planning horizons or planning cycles. At the end of these, one needs to make a correction for the errors in past planning cycle and re-plan for the future incorporating both errors of the past and requirement of the future. Longer the planning cycle, longer is the time taken to correct the errors and bigger is the correction cycle, therefore the wave of inventory movement and capacity utilization. Every supply chain has the twin challenge of ensuring inventory movement decision for maximum utilization of assets and ensuring fulfillment of entire demand. Widely used supply chain practices – both for standard and nonstandard products – make one or both of the following assumptions about reality to make such decisions. • With more information, one can predict the demand for future in reasonable accuracy. • With more information, one can calculate precisely the capacity of manufacturing. Both these assumptions are right if one wants to explain variations in hindsight. For example, everyone seems to know the exact (and a very obvious reason) why actual sales deviated from sales forecast. But they fail to predict the future, more so close to economic downturns and upturns. A plethora of variables impact demand; one can never be sure when a variable’s impact is noise and when an impact is a signal (worth a listen). As a result, most forecasting tools fail the retrospective test – use past data to predict the immediate past. Hence, using forecasting data to create and move inventory in the supply chain invariably leads to surplus, shortages. At the same time, it creates waves of capacity utilization. The waves are more gigantic during downturns as it takes time for entities to adjust to real demand. Similarly, manufacturing planning techniques assume that it is possible to accurately define capacity for maximum utilization. However, varying product mix and uncertainties make it nearly impossible to determine the exact capacity required for any point of time. As a result, any upfront inventory creation decision results in periods of overload and under load. This approach of schedule-based planning and associated errors leads to inventory pile-ups at vendors’. It is not uncommon to find vendors complaining about high finished goods inventory that has not been picked up by the main organization, even though the goods were produced exactly as per schedule. Moving away from push system of upfront scheduling of capacity and predicting demand for a month or a week to a daily pull system in the entire chain, including suppliers, operations, and customers, not only reduces inventory in the chain but also uncovers excess capacity. Pull systems depend on initiating movement of inventory based on rate of completions while maintaining a constant inventory profile in operations or distribution. This takes away the need to arrive at accurate capacity or demand for future. The reduction in inventory in the entire chain takes away the pressure of tampering with vendors’ payables. At the same time, when capacity usage improves, the entire gross contribution adds to the bottom line of vendors creating an environment where gains can be shared with the organization, particularly in cases where the main organization takes the initiative and makes the special effort to streamline flow in the entire chain. The released cash and capacity can be used to build strategic inventory or capacity buffers to offer guaranteed and reduced lead time in the market to grab more orders during a downturn. The suggested approach provides a competitive edge to an organization, more so because it flies in the face of typical approaches adopted in the downturn.